Is an exclusive residential and recreational estate situated in 645 hectares of verdant countryside and pine forests bordering the Atlantic Ocean and part of the Ria Formosa Natural Park. Since its creation in 1972, the development concept of Quinta do Lago has been one of low density. Even though when fully developed, the constructed area will occupy only eight percent of the whole estate. This is guaranteed by regional planning control and ensures maximum privacy for property owners and protection of the environment of Quinta do Lago. The facilities within the estate offer a wide variety of activities including golf, tennis, horseriding and non-polluting watersports. There are many fine restaurants and night-spots. The different residential sections, whether individual villas with large private gardens or low-rise apartment clusters, are always constructed using one of the special features of the estate, such as: golf courses, woodland or lakes, as a focal point. Quinta do Lago is a symbol of quality and one of the few places in the world where you can purchase or rent a luxury villa and enjoy a sophisticated lifestyle in the tranquil surroundings of a nature reserve and located only 15 minutes from Faro Airport .Special attention is paid to the environment at Quinta do Lago because 18.4 hectares of the Ria Formosa Natural Park falls within its boundaries. This tidal inlet is the UNESCO protected home of migratory birds and a "wetland" of world importance. It is one of the last unspoiled coastal zones in Europe. Quinta do Lago has created two nature trails which have been designed to enhance awareness of the environment value of the area. We have a large selection of accommodation in Quinta do Lago. Ranging from Luxury villas to apartments situated in tourist resorts Available to rent we have3 to 5 bedroom villas all with pools, most of the gardens back onto a golf course. Villa Louise a 4 bedroom villa close to tennis centre. This is a wonderful villa in the centre of Quinta do Lago. Slightly to the north there is Casa do Alecrim 3 Bedroom3 Bathroom villa also with a heatable pool. Within the resort is Lakeside Village, located on the banks of a large lake, which offers many water sports and a central pool. You can either rent 1 or 2 bedroom apartments or individual villas.Quinta Formosa offers good value townhouses with wonderful golf views. Quinta do Lago offers a great variety of outstanding facilities, some of which are recognised internationally for their quality. The natural features of the terrain, together with the excellence of the design and maintenance of the fairways, places Quinta do Lago among the best golf courses in Europe and indeed one of the 50 best in the world (Golf Digest) Two 18-hole courses designated "Quinta do Lago North" and "Quinta do Lago South", cover over 240 hectares of Bermuda grass (Tifton 419 and Penn Cross greens). The course is par 72, in either combination. The original 27-hole course was designed by American golf course architect Williams Mitchell of Palm Beach, Florida, and the other nine-holes were designed by Florida- based architect Joseph Lee and his associate William Roquemore. Quinta do Lago has been the venue for varius international tournaments, including seven Portuguese Opens. Several amateur competitions are also staged each year including the Johnnie Walker Amateur Euro Classic. Together with the excellent Dona Filipa Hotel's San Lourenzo 18-hole course and the 18-hole Pinheiros Altos course, Quinta do Lago is one of the largest golfing complex in Europe and accounts for more than 20% of golf in the Algarve. Golfing facilities here include excellent driving ranges, putting greens, Clubhouses with bar and restaurants as well as pro-shops. The centre has stabling for 26 horses and a large arena for showjumping and dressage. The staff cater for all standards, from novice to advanced riders. Quinta do Lago has miles of riding trails and the surrounding countryside and uncrowded beaches have much to offer the explorer on horseback. A three and one-half kilometre stretch of golden beach at the edge of the unpolluted waters of the Atlantic Ocean provides diversion and relaxation for all the family. A beach Pavilion offers bar and restaurant facilities throughout the summer. One of the attractive features of the Quinta do Lago estate is the number of fresh water and seawater lakes, either forming part of the golf course or as the backdrop for some of the magnificent villas. The main lake, with an average depth of two metres, is used exclusively for non-polluting watersports such as sailing and watersurfing. A watersurfing school with its own restaurant operates here. 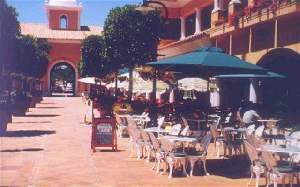 On the of edge of the resort is a small well designed shopping centre with supermarket, bars, resturants and shops. The centre all so offers plenty of parking.